Team jerseys are a key element of your team’s identity, and you want to make sure that they are crafted with care to properly portray that identity. Additionally, jerseys can become quite expensive to customize, as the multi-colour logos and individual player names + numbers quickly raise the production costs. We understand that plenty of sports teams are run by volunteers and may have small budgets for this sort of thing. With that in mind we’re going to take a look at some ways that you can save money and still get an excellent team jersey. The first thing you should try to do is limit your colours as much as possible. Now, before you go chopping colours from you logo (although a logo with less colours will always be easier to print), you should make sure you pick a jersey that is one of the colours in your logo. Lets say your logo is blue, red and black, if you pick a white jersey you’ll have to print all three of the colours – but if you choose a red jersey you’ll only have to print two. (*Bonus points if you’re allowed to print your sponsor’s logos as single colours as well). Choosing a reversible jersey will help cut your costs as well, as you can use one side as your home uniforms and the other for the away uniforms. All of the colour considerations we talked about above should apply to both your home and away kits. Reversible jerseys won’t always be available in the style or colours that you may want – and some teams simply don’t need multiple uniforms, so make sure you think about what best suits your needs. The next thing you’ll want to do is make sure that the names + numbers on the jersey backs are vinyl graphics. Screen printing and appliques will give you more detailed designs and colour options, but vinyl will always be more affordable. Vinyl is the standard for jersey numbering here at Printworks because it is much easier to work with at smaller quantities than screen printing. 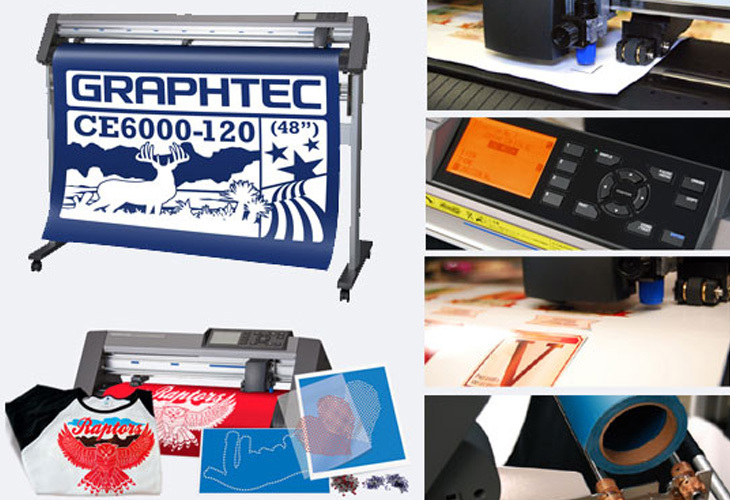 Our new vinyl cutter – the Graphtec CE-6000. If you have any questions about using vinyl graphics for team jerseys (or any other piece of clothing), or would like to receive a FREE quote you can send an email to info@printworksnb.com or call the shop at (506) 642-6563.